It goes without saying that Caregivers play an important role for families. They are also a significant sector of our small business community and save government a ton of money. From a small business perspective, care home and adult foster home operators face many challenges such as being on-duty for 24 hours, the loss of personal and family time, government rules and regulations, and in some cases, difficult residents. 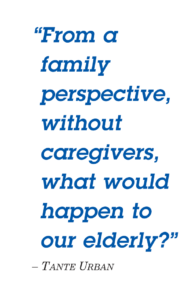 From a family perspective, without caregivers, what would happen to our elderly? Where would our elderly go? Who would take care of them? What personal sacrifices are needed to take care of our elderly and are we ready to make them? Personally, I’m fortunate to have a loving and caring sister—Donna Urban Higuchi—who stepped up to the plate to take care of my Dad Daniel when he became ill. Without my sister’s sacrifice, I really don’t know what would have happened, especially because as a restaurant/business owner, I need to be continuously on-site. I am lucky and blessed. My Dad received the proper care and attention—and love—that a caregiver can provide. In the caregiving business, Filipinos dominate. I’m not only talking about care home and adult foster homes. In any health care facility—such as Maui Memorial Hospital now known as Maui Health System and Hale Makua, Filipinos are RN’s, CNAs, etc. Nationally, we celebrate Nurses’ Week and Nursing Home Week in May, Nursing Assistant Week in June, and Home Care Aide Week and Family Caregiving Month in November. Remember, whenever we celebrate caregivers, we are celebrating members of our Filipino community—and that’s another reason to unite and be proud.